Other photos: Photo 1, Photo 2, Photo 3, Photo 4, Photo 5, Photo 6, Photo 7, Photo 8, Photo 9, Photo 10, Photo 11, Photo 12, Photo 13, Photo 14, Photo 15, Photo 16, Photo 17, Photo 18, Photo 19, Photo 20, Photo 21, Photo 22, Photo 23, Photo 24, Photo 25, Photo 26, Photo 27, Photo 28, Photo 29, Manufacturer Provided Image, Manufacturer Provided Image. Ready for the season & beyond! 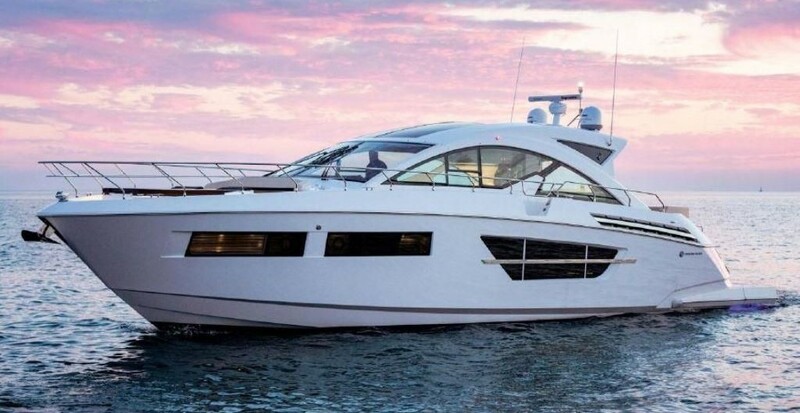 Welcome Home is how you will feel the moment you step on board this immaculate 48 Cantius! This magnificent boat made dreams come true for it's owner! Purchased new in 2014 in Wisconsin! After some time boating on the Great Lakes the owners took 4 1/2 months and ran her south through the lakes and down the East Coast to her current location in Hilton Head, SC. This 48 Cantius is immaculate inside and out! Look closely at the pictures! Zoom in on the motors and pods! She is beautiful! As soon as you board "Welcome Home" you notice the large hydraulic swim platform built to carry the dinghy or jet ski of your choice. Step into the cockpit and you find a design for easy outdoor entertaining with refrigerator, icemaker and grill all built in. The u-shaped seating makes for comfortable dining al fresco for family and friends! Open the sectional glass doors to the salon and now the entire boat becomes one giant open air living space! The salon hosts enormous windows providing guests and captain with visibility that is second to none! To port is another sofa dinette which features a sloping end offering chaise lounge comfort. The flip up bolster at the helm offers the captain comfort either sitting or standing. The tremendous visibility combined with Volvo IPS joystick control not only make this 48 easy to operate but also incredibly fun to run! Just a few steps down and you enter your private paradise. For those mornings when you are not in a hurry The lower salon offers an amazing galley, dinette and flat screen tv just off the master and vip cabins. The walnut flooring throughout the boat highlights the richness and quality fit and finish of Cruisers Yachts. The VIP guest stateroom is forward which features a split head. The toilet and very large stall shower are two separate spaces. Cedar hanging lockers and flat screen tv offer your guest a true VIP experience. Aft of the lower salon is the full beam master suite! Full walk around bed, massive head with large stall shower and vanity area to port make this master feel more like a suite than a stateroom! We cannot wait for you to see Welcome Home!